Hey, what’s up guys? David Glenn of davidglennrecording.com, home of the free VIP mix training bundle. 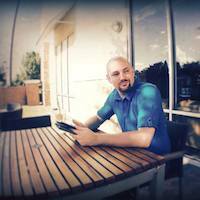 Go check out davidglennrecording.com, where you can pick up multiple free video courses. We’ve got impulse responses, two sets of multi-tracks, all kinds of stuff for you, just for becoming a subscriber. Go check that out. And then also, theproaudiofiles.com for all of the amazing free content over there. 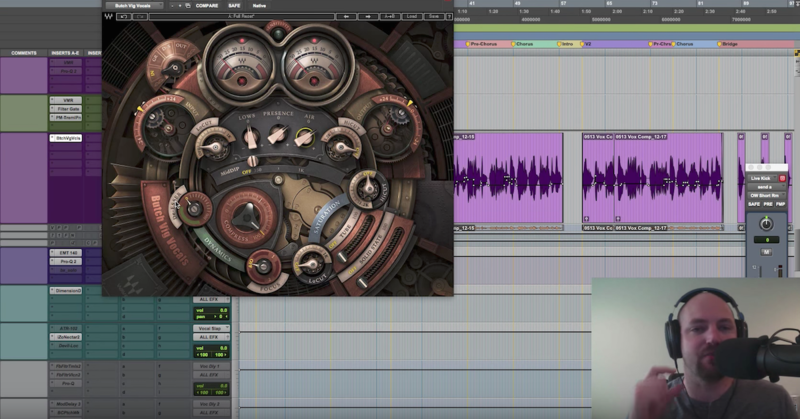 In this video, we’re going to continue on with looking at this Butch Vig plug-in from Waves, but I’m going to take more of a hybrid approach. An argument could be made that you could recreate all of this. I’ve shown a video on how you can take stock plugs, and free plug-ins and recreate the different modules and what’s going on here, but now, it’s pretty quick and easy to throw this on and get something sounding really good really quickly. So, what I want to do is show you how maybe you do use this, but then you want a little bit more control without going through the multiple parallel chains and all that extra stuff. Just want to take it a little bit further. So, here’s a hybrid approach. I’m going to go ahead and move the Butch Vig plug-in down a couple of patches here, and the first thing I’m going to talk about is the Virtual Mix Rack from Slate, because I love VCC across my mix, I think it’s great, so I’m going to dial in – I’m going to solo this vocal and dial in some gain with that. Okay, so maybe a couple of frequencies that we want to get a little bit tighter on, get out – I’m doing this quickly for example’s sake, but you guys get the point. You’ve got a couple more bands of flexibility if you want to get surgical. Maybe you’ve got a bit too much room noise? You want to go hunting for that and find that, you come up here and sweep around, and then pull that back. Get a little bit more surgical. Moving on from having the greater control of your reductive EQ phase, we can come in here and we can actually limit this – I’ll use the Waves L1 – we could limit before the plug-in to get rid of some of the openess of the vocal if we want to control that a little more. Okay, so that may be a bit much for your taste, but you can see how just adding that little bit of gain reduction to catch the peaks before we hit the compression within the Butch Vig plug-in, we’re already kind of leveling it out and getting a little more control. All about control. I’m just looking to have a little more hands-on, OCD approach to what I want this vocal to sound like, while taking advantage of all the beauty that is the Butch Vig plug-in. The EQ sounds great, the filters are awesome, the de-esser works, compression is solid, there’s a lot of great stuff. Especially the saturation. Really hearing a lot of great reviews on the saturation over in some of the forums. But, to take it a little bit further, and not to have 30 plug-ins, it’s a cool way to kind of gain some control over that. So, let’s take a listen one more time. Okay, so quite a volume difference, but you hear how we brought that vocal forward? We’ve given it some character, we’ve cleaned it up, and we’ve taken advantage of some of these other plug-ins to help out with the processing going on here with the Signature Series plug-in from Waves a little bit more. Next, I want to talk about some sends, and in the last video, I mentioned that if you want to learn more about the sends, and hit me up. It was a couple hundred views in, and I had quite a few messages asking about it, so let’s go ahead and look at these. We’ve got the gentle chorus, and the Mono Dimension-D. Here’s my chorus send right here, and I use the iZotope Nectar 2. This could be the Waves Mondo-Mod as a gentle chorus setting that I really like. You could go to your AIR chorus. Any chorus that’s really subtle and gentle, but at 100%, and then sending it into that. Let’s take a listen to what that can do for it, and kind of help give it a little bit of a silky smooth tone to it. Here’s the chorus right here, and then I’m going to blend that in. What I like to do is I like to bring it up into the mix, and get it exaggerated, hear it, and then pull it back down to where I just kind of feel it. Let’s go ahead and mute it. I’ll let it play, and then I’ll pull it out so that you can hear the difference. So, just a little bit of that silkiness coming in. Then the Dimension-D from UAD is pretty much the exact same feel. It’s set to mono, and I’ve got it on number 2 here, and we’re going to pull that in. Let’s see, am I on the right send? Yup, right there. Cool. So, here’s with pulling it in. Okay. So, thickens it up a little bit. Adds some warmth, and then we could go into – I’ve got a plate. This could be any verb. Just trying to give it a little bit of space, and I’m going to show you some of the sends, and something else I’m doing with the Butch Vig plug-in, but here’s the plate. Pull it out, and then in. I’m exaggerating that so you can hear it, but then not only do I have the UAD EMT-140, you can check those settings out there, the Plug-N-Mix Plate is actually pretty sweet, so if you have that, that’s a pretty sweet one to use. The EQ looks like a spaghetti mess, right? I’ve cut some of the lows, cut some of the mid-range out, there was a frequency around 1.2kHz that I just hated, so I pulled that all out. Cut a lot of the highs. Let’s bypass that and hear the reverb without the EQ. So, you can hear. All I really wanted from that reverb was the warm sustain that it kind of added to the vocal, and then in the track, it’s always important – none of this matters unless you’re referencing what’s going on in the mix, but just to kind of walk you through what the processing was. The next up was the eighth delay, which I don’t think I ended up using in this one, but let me pull that open and show you what you can do with the Butch Vig on the back end of your inserts. So here’s that. Okay. So, that’s kind of cool. Quite a bit more than just a slap delay. Let me pull the reverb back down. Okay, now on the back end of an effects send, I could really see the Butch Vig vocal plug-in being valuable, so on the back end of this stock Digi delay, I’m going to show you that. Just kind of an eighth delay. I’m trying to cram a lot into this tutorial, forgive me for going quick, but there’s an eighth delay there. Standard settings. Then, I’m going to throw the Butch Vig on the back end and just kind of dial in some tones with it. So let’s see what we get. Okay, I’ve got the wrong send, so let’s come over here to the eighth delay, and we’ll back that down. Okay, so I dig that compression, I just want to make sure I control the input going in. Then let’s mess with some of the knobs here. Okay. So, you can see how you can really manipulate and shape some of your effects by adding one of these Signature Series to the back end of your effects. And you could play that back a couple of times, but I can really hear how removing that 6.5 dB that’s built into the Waves plug-in from the 1kHz region allows the effect to compliment the lead vocal, as opposed to dominating and getting a little honky or weird with the two clashing in there. So, I went quick, but I hope you guys see how some of these effects can add to your lead vocals, your background vocals… I use the Waves Signature Series a lot on background vocals. Just kind of throw it up, put ’em together, it’s nice and quick, and the lead vocal I may sometimes use it, but I’ve also got my Dave Pensado adapted vocal chain that gives me a lot more control, and I can really get in and automate and between sections, and get to work on that, but by no means does it mean that I won’t use the Waves Signature Series on an entire lead vocal. So, I hope you dig that. If you want to see more vocal mixing, go to mixingvocals.com. Don’t forget to check out theproaudiofiles.com for all of the incredible content over there. If you have any more questions on any of this, if I went too quick and you want to see me elaborate a little bit more, feel free to email me at david[at]glennrecording.com, and we will catch you guys in the next video.